Nothing evokes Christmas cheer like the annual unveiling of the celebrated department stores’ holiday window displays. Manhattan department stores such as Macy’s, Lord & Taylor, Bloomingdales, and Chicago’s Marshall Field's, have been well-known for their impressive holiday window spectacles for generations. 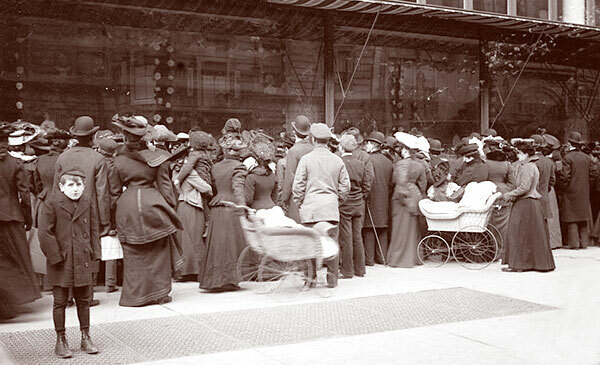 During the last quarter of the nineteenth century, the wide availability of large sheets of plate glass for oversized windows led to the concept of using department store window displays to attractively display the store's merchandise. 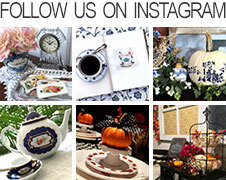 It quickly followed that elaborate holiday window displays before Christmas, combining merchandise and fantasy holiday scenes, attracted a multitude of customers. Store merchants began to lure shoppers to their stores with ornate and whimsical Christmas window tableaus as a way to sell their inventory at the end of the year. In the 1870s, R. H. Macy’s was the first to develop the notion of the “holiday window display” by attractively displaying their holiday merchandise in their New York City department store’s windows. Families would bundle up and gather, noses pressed against the glass, to gaze in awe at the fairytale holiday scenes. 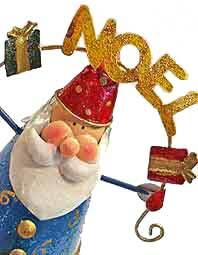 In addition, R. H. Macy’s is credited with bringing the first in-store Santa Claus for all the children to see. Now more than 100 years later, department stores in cities like New York, Dallas and Chicago continue the annual tradition of elaborate and highly-crafted holiday window displays as a magical treat for the young and old alike. This lavish holiday window display features a Santa and his nearly life-size fur-covered reindeer surrounded by dolls, toys, stuffed animals and drums. The sleigh is draped and overflowing with toys. 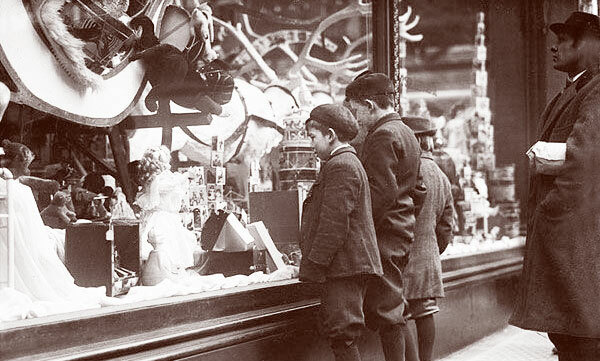 A group of warmly dressed children wistfully gaze at the elaborate window display of Christmas dolls and child-size furniture presented by R. H. Macy’s in 1915. Baby dolls dressed in ruffles and lace are perched in a child’s wicker rocking chair and wicker carriage, while other dolls “fly” in front of a painted winter scene backdrop. 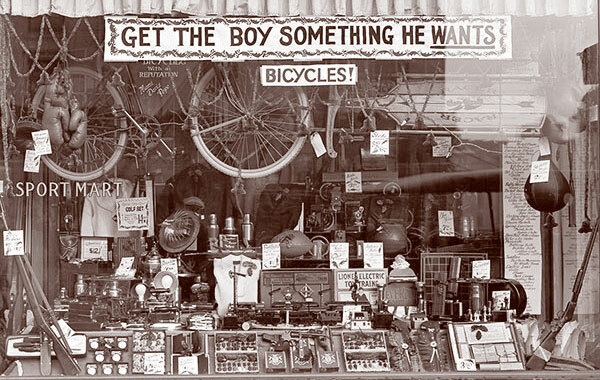 The Sport Mart in 1921 displayed all the favorite Christmas gift ideas for boys in their Washington, DC store window. 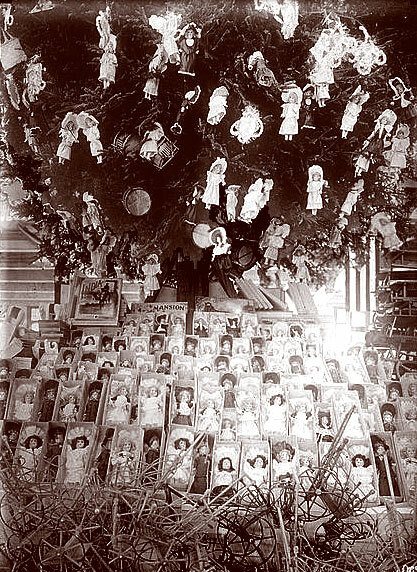 This 1910s Christmas show window is packed with gifts for girls - rows and rows of dolls behind a collection of doll carriages. 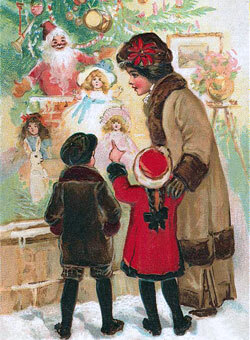 Here a 1910s crowd looking at a Christmas toy display blocks the view of the young boy facing the camera on the left. 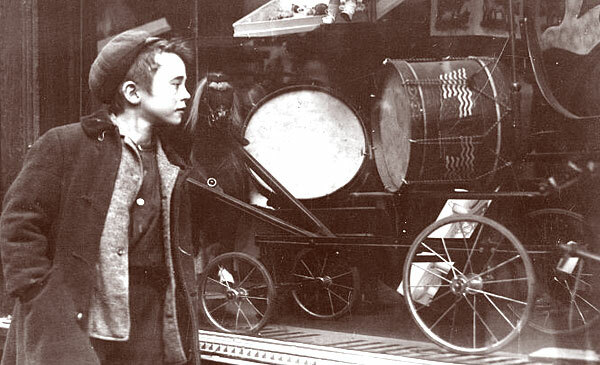 This young boy gets a close-up view of the Christmas holiday window display featuring vintage toys, drums, wagons and more. A presentation of stuffed animals in widely varying sizes is shown in another of R. H. Macy’s windows in 1915. An amazingly large elephant is posed in the center and surrounded by other large creatures: llama, sheep, camel, and buffalo – many on wheels. Other smaller stuffed toys are scattered about and “fly” in front of the snowy backdrop. Not all Chistmas department store windows were filled with toys for children. 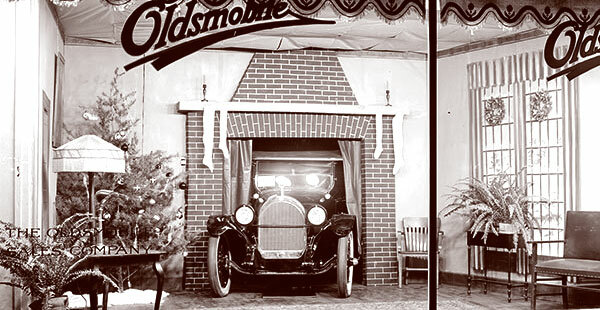 This 1920s Oldsmobile holiday window display features an adult gift, a vintage automobile entering the living room through a fireplace hung with stockings. 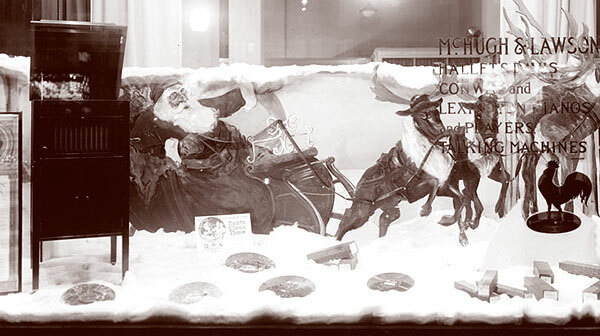 McHugh & Lawson, who sold "players and talking machines", featured a Santa and sleigh in their charming Christmas window display in the 1920s, again highlighting "toys" for grown-ups.